The charming Miss Beatrix Potter has been on my mind of late. I recently stumbled across the movie, “Miss Potter”, that is based on her life. I had seen the movie before but couldn’t resist watching it again. I have always loved her delicate watercolors that brought her delightful characters to life. I particularly loved the moments in the movie when her paints would become animated as if they were indeed, very much alive. The movie is a beautiful love story and an inspiring tribute to a strong willed and determined artist who has delighted millions of children and adults with her lovely stories and beautiful artwork. 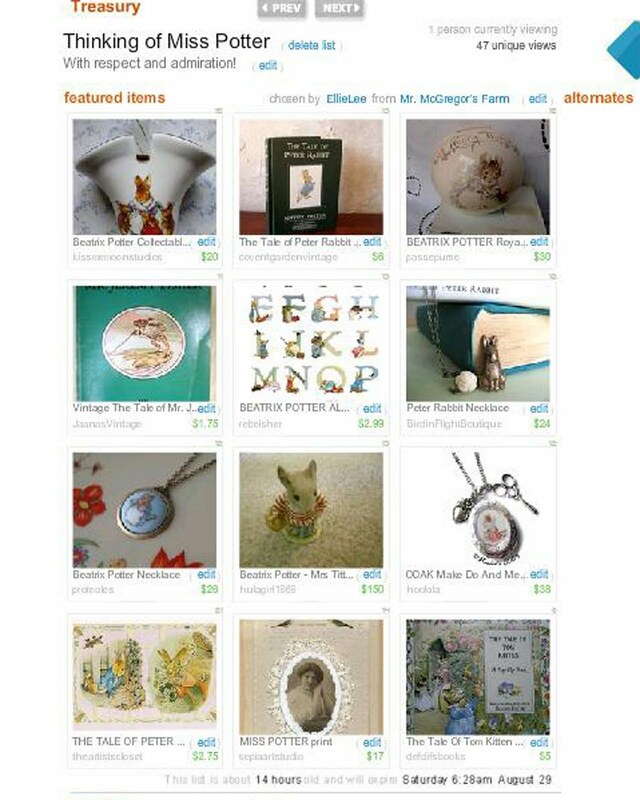 As my own tribute to Miss Potter, I put together a Treasury on Etsy of some of the many wonderful Beatrix Potter items that can be found there. Until sometime tomorrow, you can view the treasury on Etsy. Clicking on the pictures in the treasury will take you to the description page for each item. After the treasury is gone, you can click on the shop names below and be linked to the items included in the treasury. I hope you’ll visit these Etsy shops and browse through all the great items they have to offer. I’ve also inserted a lovely video below that shows scenes from the movie, “Miss Potter” and has the charming voice of Katie Melua singing “When You Taught Me How to Dance.” This is the hauntingly beautiful song played during the closing credits of the movie. Dreamy! Note: Before you watch the video, you might will want to scroll to the end of the page and silence my Playlist. Lovely post and treasury. thank you for featuring my die cuts. I have now placed Miss Potter on my Netflicks list. Lovely post and lovely blog. I enjoyed being reminded of the film when I listened to the music. Lovely Blog and a lovely theme, Miss Potter, I have loved her books since I was a child and the movie was wonderful! I appreciate the exposure for my little etsy shop, passepurse. Thanks Vicki, for all your wonderful work! Thank you so much for your sweet comments on my blog.